As we all know, the course of new romance can be a rollercoaster ride of highs and lows – the hesitant getting to know you nervousness of the first date, the intriguing will you won’t you of that first kiss, the gut wrenching ‘end of the world’ blow of the first argument. It’s a perilous journey, but one that we willingly hop aboard time and time again, as do the frustrated lovers of writer-director Dan Kokotajlo’s relationship disaster short Off Yer ‘Ead. We sat down with Dan to discuss tight shooting schedules, fractured timelines, and improvised whole takes. Our first introduction to your work came in mid-2012 with your East London oddballs inspired short Gummy Man Rage, but how did you make your way into filmmaking prior to that? I got into filmmaking through watching plenty of films and messing around with a consumer camcorder. After Art College, I was painting for a living and making music, then I eventually went out and shot some sarcy comedy music videos [Chopps Derby] that people really seemed to enjoy. Then I studied an MA in screenwriting to learn more about storytelling. After that I shot a short film called The Mess Hall of an Online Warrior for about £50 – it was selected at SXSW in 2010. Off the back of that I managed to secure some funding from the old Vision+Media/UK Film Council to direct a ‘proper’ short. Fairly recently I was selected for iFeatures2 and the new Biennale Cinema College scheme to develop a feature. Andrew Shim is a great character actor, how did you get him onboard in the role of Si? My producer, Marcie MacLellan and I decided the role would suit Andrew and I was aware of his loose improvisational working method. Marcie managed to interest his agent, I had a good chat with Andrew on the phone and it all went from there… I’ve always loved Andrew’s work and look forward to seeing more of him on the big screen. 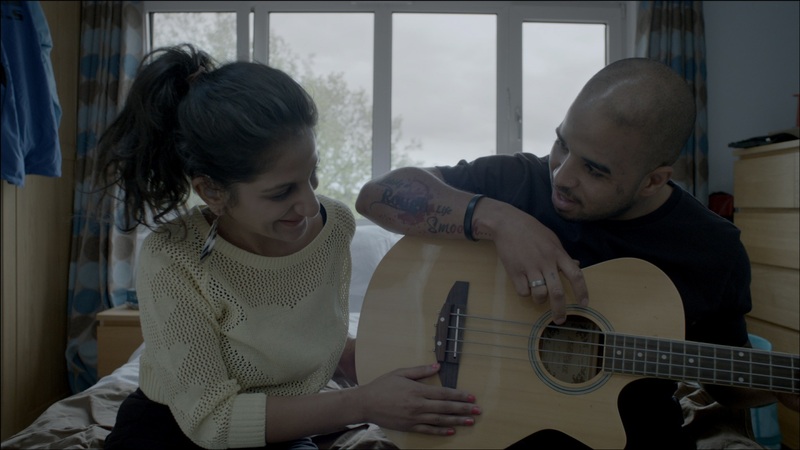 The abrasive Sheneez, played brilliantly by Aliya Gulamani, is partially deaf. Was that present at the script level or did you adapt the character for Aliya? It was present in the script but it wasn’t until we found Aliya Gulamani that the character was fully realised. Aliya and I went through the script to determine how the character would truly act in each scene. Aliya brought a lot of ideas and nuances to the character. Casting was tricky as I was only willing to work with an actor who was deaf/partially deaf. We had a couple of auditions with no luck. We got in touch with a deaf-led company called Remark! who specialise in deaf awareness in all aspects of media. Fortunately they put us in touch with several actors, one of which was Aliya. Aliya was an amazing, bold talent. She had some acting experience and worked as a presenter for the BBC. She was also a graduate of the Royal Court’s Young Writer’s Programme and she really seemed to understand Sheneez’s difficult character. Sheneez’s freaky contact lenses for the dating app pictures are a nice addition to her character, where did that trait come from? I had seen this sort of thing in people’s selfies on social networks. It’s one of those ideas that feels simple and familiar to me but also has a poetic and bittersweet quality to it that works well for the character. The film’s scenes play out over single takes, developed through improvisational techniques, how did you come to settle on that approach? It felt like a worthy challenge and excited me. The approach was influenced by filmmakers such as Roy Andersson, Christian Mungiu and Mike Leigh. I’m a believer of less is (usually) more when it comes to editing. The performances become more truthful and you’re less distracted by cuts. I’ve always loved improvisation as it creates lots of natural humour that’s hard to find in writing. Did you work with the actors much beforehand or employ particular techniques on set to ensure you’d get the performances you needed in the single day you had to shoot? Some of the crew were worried about getting all the scenes shot in one day, especially when I mentioned the word ‘improv’. But I knew it was going to be okay. We had meticulously planned the shoot which left me to focus on the scenes and acting. I had talked to the actors about the scenes before the shoot but we didn’t rehearse. We didn’t have the time but luckily both Andrew and Aliya preferred to work in this way. It felt natural and I had faith in their talent. We managed to find time to discuss each take and decide what elements to keep and develop, and we ended up shooting 6 or 7 takes of each scene. But if it wasn’t for the single take concept, I don’t think we would have been able to shoot it in a day. Differing composition and colour grade styles are used to help orientate us within Off Yer ‘Ead’s broken narrative. How did you developed those with your DoP Gabi Norland. Initially I wanted to shoot on 16mm and digital, similarly to Blue Valentine. But there was no way we could afford it. Gabi got me interested in the Arri Alexa camera’s ability to load looks into the metadata so you could see the grade while shooting. We sat down and developed grades on the computer beforehand and then used several of these as presets for the shoot. Since the story had a broken timeline and we weren’t shooting chronologically, it created the right atmosphere. It also helped all the crew keep track of timelines and overall made decision making easier for me. Did your method of shooting provide any problems once you began to put the film together in post? Luckily this is where the great performances really paid off. And although the one take style limits what you can do in the edit, I still ended up with three or four completely different rough cuts. The main issue was that each take of the same scene made the story go in a slightly different direction so I had to choose scenes that all worked in unison. Thanks to the nonlinear narrative I was able to move scenes around and still create a coherent story. You’re screening at the London Short Film Festival at 1:30pm on the 18th January as part of the New Shorts #27 Love Makes The World Go Round programme, what are the plans for Off Yer ‘Ead after that? More film festivals this year hopefully. Nothing set in stone, but it’s early days. Do you already have your next project in mind? I’ve a few features and two shorts in development, inc. my iFeatures2/Biennale project, The Prefect. I’ve also directed a wacky music promo (in collaboration with various vfx/motion graphics artists) coming out later this month. I’ll send you the link!